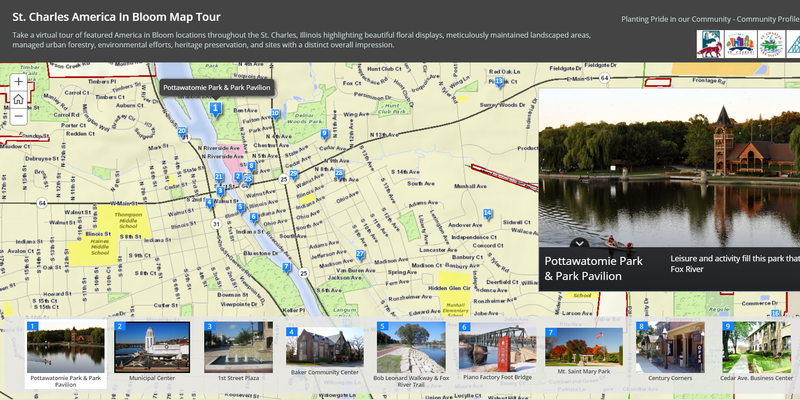 What is America in Bloom – St. Charles? Residents, and members of local businesses and organizations, including the City of St. Charles, have joined together to form America in Bloom - St. Charles. They work together to improve St. Charles through landscaping, environmental, and heritage preservation projects. 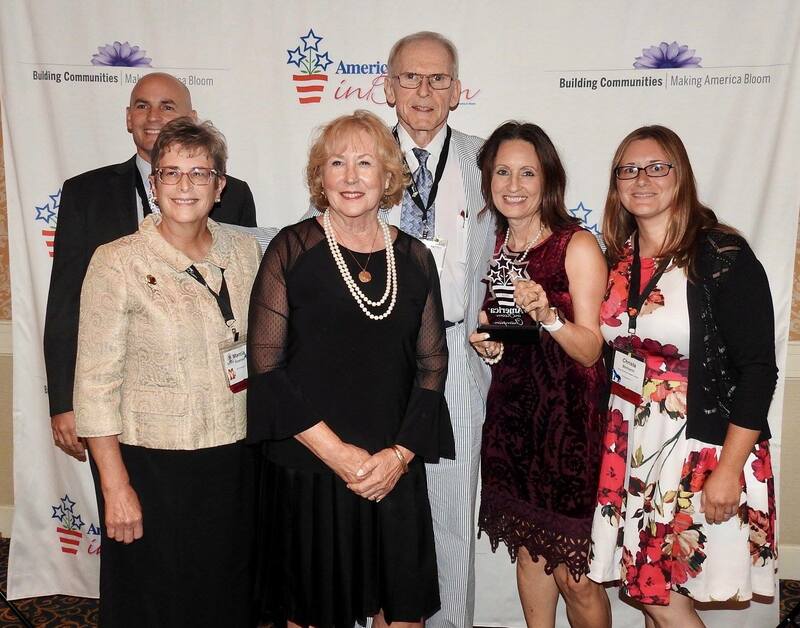 In 2018, St. Charles took home top honors in the America in Bloom National Awards Program, winning the Circle of Champions award for its population category, 25,000-75,000. The competition was all other former champion cities that, like St. Charles, had previously won in this population category. The award was presented at the annual America in Bloom National Conference in Lexington, Kentucky Sept. 27-28, 2018. In 2019, St. Charles will be the host city for the Symposium and Awards Program. Two America in Bloom judges visited St. Charles July 16 and 17, 2018, and toured floral displays, landscaped areas and environmental project sites. The judges also reviewed St. Charles’ heritage preservation and urban forestry efforts, in addition to noting community involvement and overall community impression. St. Charles received 9 starts out of 10 in the judges’ final evaluation. America in Bloom – St. Charles Committee would like to extend its gratitude to all the volunteers and sponsors that made this year’s entry in the awards program a success. It is truly a community effort that could not have taken place without, the generosity of our sponsors, the support of local businesses, or the dedication of our many volunteers. Front row: Marcia Koenen, America in Bloom – St. Charles Volunteer Coordinator; Maureen Lewis, America in Bloom - St. Charles Committee Co-Chair & Ward 5 Alderman; Diane Cullen, America in Bloom - St. Charles Committee Co-Chair; Christa Bormann, Heinz Brothers Green House and Garden Center. Back row: Chris Adesso, City of St. Charles; and John Thornhill, resident. Thank You from America in Bloom – St. Charles! 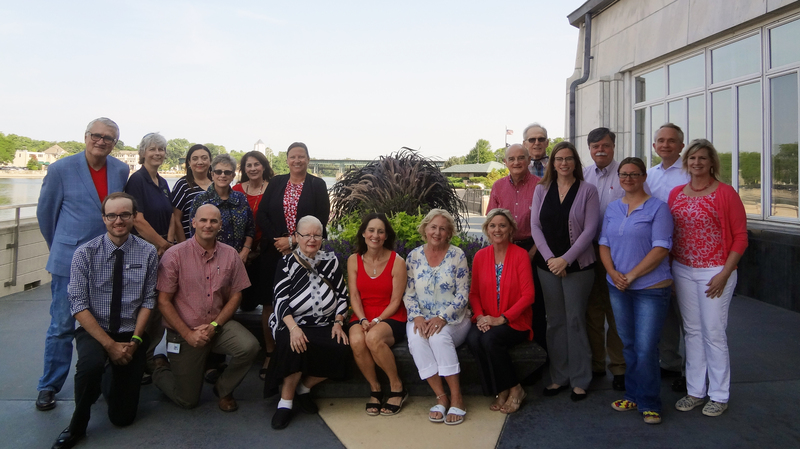 The America in Bloom - St. Charles Committee works closely all year long with many businesses, community organizations and volunteers to prepare St. Charles for its time in the spotlight. The Committee would like to thank the dedicated efforts of our local organizations, volunteers, residents and sponsors. Maureen Lewis, Ward 5 Alderman & Committee Co-Chair; Diane Cullen, Committee Co-Chair; Barbara Campbell, resident; Frank Esposito, resident; Heather Goudreau, resident; Marcia Koenen, Volunteer Coordinator; Nona Koivula, resident; John Thornhill, resident; Steve Martin, First State Bank; Jim Nau, Ball Seed; Christa Bormann, Heinz Brothers Green House and Garden Center; Holly Cabel, St. Charles Park District; Pam Otto, St. Charles Park District; Jenna Sawicki, Downtown St. Charles Partnership; Michelle Cianferri, Greater St. Charles Convention & Visitors Bureau; Pam Salomone, St. Charles Public Library; Tim Kirsininkas, St. Charles Public Library; Chris Adesso, City of St. Charles; Lisa Garhan, City of St. Charles; Kyle Paup, City of St. Charles; AJ Reineking, City of St. Charles; and Isabel Soderlind, City of St. Charles. For more information about America in Bloom – St Charles, contact Diane Cullen at dianelcullen@gmail.com or Maureen Lewis at mlewis@stcharlesil.gov or 630.584.4622. If you would like to get involved, please contact Marcia Koenen, Volunteer Coordinator at 630.205.2868 or mkoenen@att.net. Some members of the America in Bloom Committee pose with the Mayor and City Administrator. Front Row: Tim Kirsininkas, St. Charles Public Library; Chris Adesso, City of St. Charles; Barbara Campbell, resident; Diane Cullen, Committee Co-Chair; Maureen Lewis, Ward 5 Alderman & Committee Co-Chair; Pam Salomone, St. Charles Public Library. Back Row: Mayor Raymond Rogina; Pam Otto, St. Charles Park District; Michelle Cianferri, Greater St. Charles Convention & Visitors Bureau; Marcia Koenen, resident; Holly Cabel, St. Charles Park District; Frank Esposito, resident; John Thornhill, resident; Jenna Sawicki, Downtown St. Charles Partnership; Steve Martin, First State Bank; Christa Bormann, Heinz Brothers Green House and Garden Center; Mark Koenen, City Administrator, City of St. Charles; Lisa Garhan, City of St. Charles. What is America in Bloom - St. Charles? Click here to find out more about the sites the America in Bloom judges visited July 16-18.